Pudina chutney is one of my mother's best preparations. I love this chutney. It is so tasty, tangy and flavorful. Every ingredient used in preparing this chutney stands out on its own when you taste it. Pudina chutney tastes best with Khichdi, Bagarya Chawal or any pulao. My mother makes it even with biryani. It tastes good when mixed with plain steamed rice. I like it with roti, chapatti, dosa and even idli. 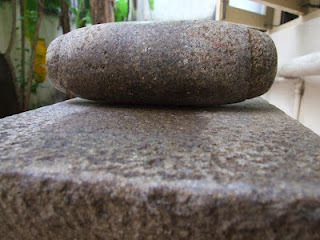 My mother even today grinds this chutney on the sil-batta / ammi kallu (flat stone with a cylindrical pestle). She very rarely used the mixer to grind it. It is so easy to prepare and gets ready in no time if you have all the ingredients available. 1. Soak tamarind in just enough warm water till it become a bit soft. Discard seeds and fibre. 2. In a mixer jar add grated coconut, salt, soaked tamarind and green chillies. 3. Grind it till the green chillies and the tamarind are well blended with the coconut. Add water little by little as needed. Do not turn it into a paste. The coconut should remain finely grated. 4. Add onion and mint leaves and pulse till the mint leaves and the onion are blended. Do not over grind as it will turn into a paste. This chutney should remain of coarse texture. 1. This chutney can be stored in the refrigerator for a couple of days and always take as much required with a dry spoon. Yummy looking pudina chutney.Some habits never die and I feel it should not however hard the new age gadgets try to takeover .Using ammi kallu is the best work out for triceps too. very delicious and versatile chutney! One of my fav. Its a classic recipe which will remain classic among many of us. Yum to the thick, minty and creamy chutney. Love this delicious flavorful chutney!